Will future landers on Europa sink? 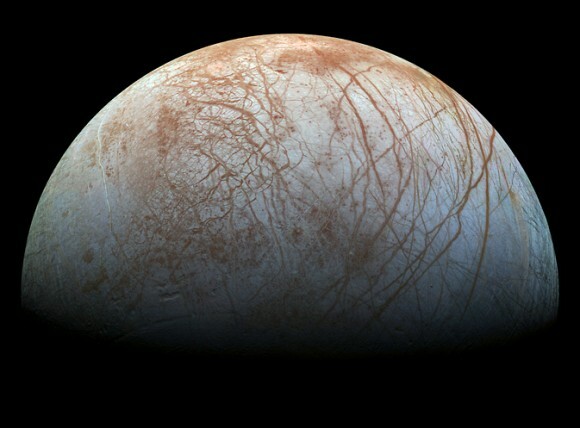 Jupiter’s moon Europa is an ocean world beneath an icy crust, and scientists want to land a spacecraft there. But a new study indicates a surface less dense than freshly fallen snow. Space scientists have every reason to be fascinated with Jupiter’s moon Europa, and, in 2017, NASA and the European Space Agency (ESA) announced they are planning a joint mission to land there. As the video above explains, this little moon is thought to have a liquid ocean submerged beneath an icy crust. Scientists believe it could host extraterrestrial life. But Europa’s surface is much more alien than any we’ve ever visited. With its extremely thin atmosphere, low gravity – and a surface temperature of some -350 degrees F. (–176 °C.) – Europa might not be kind to a landing spacecraft. The moon’s surface might be unexpectedly hard. Or – as evidenced by a study from the Planetary Science Institute announced on January 24, 2018 – Europa’s surface might be so porous that any craft trying to land would simply sink. Of course, before the landing of the Luna 2 robotic spacecraft in 1959, there was concern that the moon might be covered in low density dust into which any future astronauts might sink. Now Europa is the source of a similar scariness, with Nelson’s study showing that Europa’s surface could be as much as 95 percent porous. The puzzling, fascinating surface of Jupiter’s icy moon Europa. This color composite is made from images taken by NASA’s Galileo spacecraft in the late 1990s. Image via NASA/JPL-Caltech/SETI Institute. Nelson’s study of Europa is part of a group of studies he has conducted of both asteroids (44 Nysa, 64 Angelina) and jovian moons (Io, Europa, Ganymede). He conducts his studies via photopolarimetry, the measurement of the intensity and polarization of reflected light. Observations were made using a photopolarimeter located at Mt. San Antonio College in Walnut, California. According to Nelson, the observations can be explained by extremely fine-grained particles on Europa’s surface with a porosity less than about 95 percent. This corresponds to material that would be less dense than freshly fallen snow, raising questions about risks of sinking for a future Europa lander. Brown ridges crisscross Europa, indicating the possibility of liquid welling up from below. This suggests an active geology and raises questions about possible life on Europa. Image via NASA/PLAN-PIA01641. A mission to land on Europa is challenging in other ways. For example, Europa — along with the three other Galilean moons (Io, Ganymede and Callisto) — orbits within Jupiter’s radiation belts. A spacecraft trying to orbit Europa would be quickly fried. That’s why NASA’s upcoming Europa Clipper mission is designed to orbit Jupiter, not Europa. It’ll sweep in and out of the radiation belts for a period of several earthly years, making flyby observations of Europa each time it passes near this jovian moon. Its observations will help answer questions about what might happen to future spacecraft attempting to land on Europa. The video below has more about the upcoming flyby mission, Europa Clipper, set for launch around 2022-2025. Bottom line: A recent study via the Planetary Science Institute indicates that the surface of Jupiter’s moon Europa might be as much as 95 percent porous – less dense than freshly fallen snow – so that a future lander might sink.